The Fashion Guide Blog : Are you ready for the sweatshirt trend? The sweatshirt is back. The piece of clothing we used to wear to do some exercise or go jogging has reinvented itself to bring us a glamorous and chic look. From Kenzo to Givenchy, we have all been delighted with this "new" trend and we all want to wear it, men and women. Among the many options you can wear a sweatshirt with a skater skirt, jeans, trousers or to look even more trendy, with a midi-skirt. Pair it with a blouse and your favourite heels and add and edge with the accessories. Have a look at these looks I created for you. What do you think about this trend? Leather A-line skirt, Topshop. Necklace, Zara. Booties, Guess. Handbag, Uterque. Sweatshirt, etsy.com. 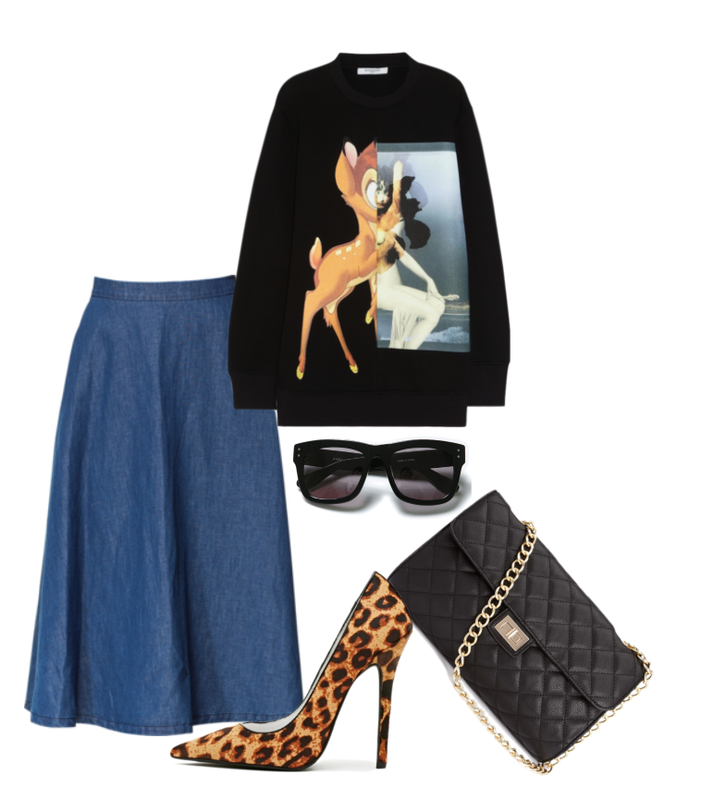 Denim midi-skirt & sunglasses, Zara. Shoes, Jeffrey Campbell. Bag, Forever21. Sweatshirt, cyfashionc.com. Jeans, Mango. Ankle boots & bag, Zara. Sweatshirt, Choies. Skirt, Dorothy Perkins. Bag, Aldo. Shoes, nastygal.com. Blouse, Topshop. Sweatshirt, Choies.